I knew commedia dell’arte influenced Shakespeare, but before seeing The Servant of Two Masters, I never thought about it influencing Disney or that Pixar and Looney Tunes are the art form's direct descendants. The comment, innocuously comic, passed quickly and garnered just a few chuckles. Yet, when Florindo was tagged as “Puss in Boots” by another character, it not only served as an apt descriptor of the over-passioned, dueling Latin lover, it really summed up the whole look, feel, flavor, tone, and even the acting of this commedia dell’arte production. Written in 1753, The Servant of Two Masters was a live action cartoon, Puss in Boots meets Fritz the Cat, Bugs Bunny meets Betty Boop. 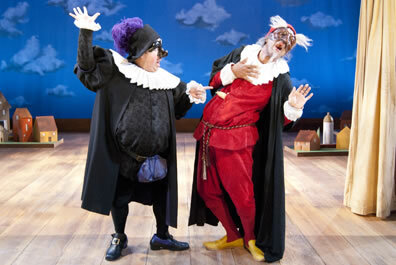 Don Darryl Rivera as Il Dottore, left, and Allen Gilmore as Pantalone in the Shakespeare Theatre Company's production of The Servant of Two Masters. This commedia dell'arte production was like a cartoon come to life. Photo by S. Christian Low, Shakespeare Theatre Company. I knew commedia dell’arte influenced Shakespeare, but before seeing The Servant of Two Masters, I never thought about it influencing Disney or that Pixar and Looney Tunes are the art form's direct descendants. All the elements of cartoons were here on the Lansburgh stage: the exaggerated gestures and faux violence, the silly sound effects, the circus humor combined with more than a hint of sexual innuendo (all women were identified as “boom-boom”), the banal dialogue spiced with winking comic contemporary references. Even the set designed by Katherine Akiko Day had a comic-book feel with miniature cityscapes, a decaying proscenium, and a sky backdrop (but yet the backstage and actors waiting in the wings were visible to the audience). Meanwhile, costume designer Valérie Thérèse Bart clothed some characters in elegant cavalier-era clothes and others in clownish gowns and patchwork that look like “a rainbow threw up on” them (I'm quoting from the play). Not only the looks, sounds, and material were akin to The Incredibles, the acting itself was incredibly animation-like. This was a solid cast, many of whom have been performing in this or other Bayes-directed commedia dell’arte productions at the Yale Repertory Theatre and Berkeley Repertory Theatre, but Jesse J. Perez as Florindo was a particular standout. He alone is worth the price of the ticket, the travel to downtown D.C., and the two-plus hours spent in the Lansburgh. With his ability to seemingly manipulate every cell in his body from his buccinator to his pinky flexor, Perez gave a virtuoso physical performance whether he was in anguish (which was often), lusting, loving, dueling, or just confused. In him, every sinew emoted passion. Bugs Bunny wasn’t this limber nor had this breadth of skills in physical characterization. Some may fault Perez for over-acting, but Shrek’s Donkey overacts, too, and that’s the point. Much more subtle but just as effectively funny was Andy Grotelueschen, whom we had seen earlier this spring as Petruchio brawling his way through the Theatre for a New Audience’s Taming of the Shrew. In Servant, he played the bratty lover, Silvio, and Groteleuschen, channeling his inner 6-year-old playing a Christmas pageant angel, gave a knee-knocking performance of enduring cuteness—even in his wittily choreographed fencing duel with Beatrice (Rachel Spencer Hewitt). I guess that last sentence requires a need to talk plot. Even the play’s storyline is cartoon-like in its complex simplicity and ridiculous turns, all relying on commedia dell’arte stock characters. Beatrice, disguised as her brother who was killed in a duel by her lover, Florindo (stay with me here), seeks to get money from her late brother’s business partner, Pantalone (Allen Gilmore). She inadvertently breaks up the betrothal of Silvio to Pantalone’s daughter, Clarice (Danielle Brooks), who had originally been engaged to Beatrice’s brother. The halting plot revolves around the two sets of lovers getting back together: the disguised Beatrice with Florindo (even though he killed her brother she madly dotes on him almost as much as he on her), and Silvio with Clarice (who, upon learning Beatrice’s true identity, begins helping her and thereby further kindles Silvio’s jealousy). The “halting” in my description is purposeful, for the plot—such as it is—halts every so often so that various characters can do their schticks. Gilmore’s Pantalone, in turning away Silvio, mimicked the song and video of Beyonce’s “Single Ladies (Put a Ring On It),” that led to him doing the splits that led to him complaining that he cracked his “eggs,” that led to him moving across the stage, legs splayed, riffing on pain. The whole point of this routine, by the way—as Gilmore admitted in an after-show talkback—was to make Grotelueschen break character and laugh, and he succeeded. References were not only contemporary but topical. Liz Wilson as Smeraldina, Clarice’s maid, took off on a rant about how men abuse women, especially in the “big domed building” down the street where “men are always penal-izing women with their laws.” Twice the cast fell into songs from The Music Man, then acknowledged they were in the wrong play as that musical was playing across town (at Arena Stage). Frankly, whatever script had been lying under all this has been obliterated as the actors intentionally layer on new jokes and push the envelope of good taste each and every performance. Not all these moments were comic, either. Out of all context, the three women—Spencer Hewitt’s Beatrice, Wilson’s Smeraldina, and Brooks’ Clarice—stepped forward to sing an operatic aria in three-part harmony. How did we suddenly apparate to the Met? For Spencer Hewitt the moment represented an STC grand slam: in this season she tangoed as Margaret in a Cuban-set Much Ado About Nothing, she mastered Eugene O’Neill’s dramatic inner thoughts and outer dialogue as a socialite in Strange Interlude, she played an Italian version of Pepe le Pew in this commedia Servant, and now she was climbing the soprano scales. At the center of all the action and distractions was Truffaldino, the titular servant to both Beatrice and Florindo, all three unaware of the latter two’s previous connections. Steven Epp, a longtime artistic partner of director Bayes and a veteran of the commedia art form, switched on a dime from acting to clowning to stand-up comic. His shuffle-step gait, his hunched demeanor, and his shy dialect made Truffaldino an endearing character, but Rivera’s own wit sliced through the façade so that we could laugh with, at, and even through him: and, of course, we were laughing at everything going on around him, too.